Green Roof at Graham Millworks Well-Established at 1 Year! 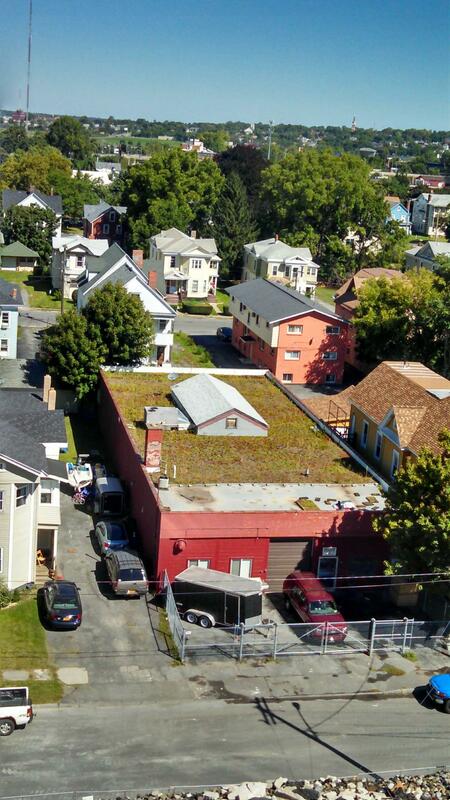 After 1 year, the extensive green roof at Graham Millworks located at Richmond Avenue in Syracuse is well established. The vegetated roof was planted in place in the Summer of 2013 using sedum plugs. This aerial view was obtained from a nearby building in September 2014. Green roof designed by Natural Systems Engineering, PLLC. Plants and soil supplied by Motherplants, Ithaca, New York. Aerial view from south of Graham Millworks. September 2014. This entry was posted in Green Infrastructure, Green Roof and tagged Central New York, green infrastructure, Green roof, green stormwater infrastructure, New York, Onondaga County, Save the Rain, stormwater, Syracuse, vegetated roof on September 8, 2014 by admin.